The soaps from Gianna Rose Atelier continue to be among my favorites. From novelty soaps shaped like cats and dogs to fruit soaps in the shape of apples, lemons and limes, the company continues to surprise and delight me with ways to spruce up my bathroom and vanity. 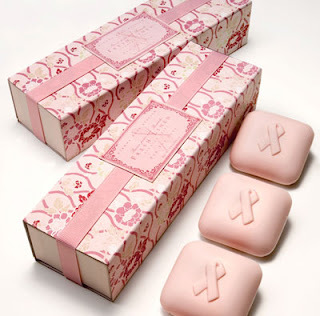 And this month, I will most definitely be buying the Gianna Rose Atelier Soap For The Cure. The gift set is enticing even before it's unwrapped -- its slider gift box is patterned with a beautiful pink floral design, while inside are four square-shaped guest soaps. But these aren't just any soaps, mind you. They're French-milled, they're scented with Fresh Linen, and they're each embossed with a pink ribbon, signifying the company's commitment to the fight against breast cancer. So why not do your part? For only $25 at giannarose.com, this set seems like a steal -- especially when you consider that 15 percent of proceeds from each sale will be donated to the Triple Negative Breast Cancer Foundation. Now that's something that smells good.